Tucked away in a San José courtyard behind Costa Rica’s canary-colored Foreign Ministry stands a nondescript 3-meter-high monolith. Housed behind the metal fence that surrounds the ministry, it’s no surprise many walk by the concrete monument without a second thought. But the casual stroller might be interested to know that it is actually a piece of history, of one of the most enduring symbols of the Cold War: the Berlin Wall. The Wall — which separated East and West Berlin from 1961 until 1989 — was a symbol of Cold War hostilities, oppression and, eventually, the peaceful reunification of Germany. 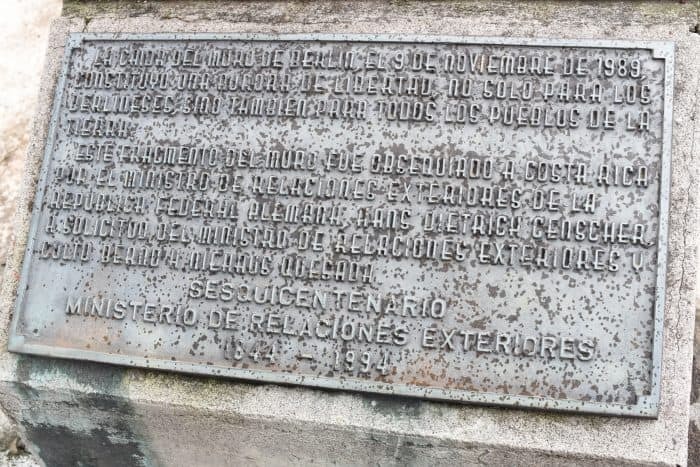 (Oh, and it’s featured in the new Steven Spielberg-Tom Hanks movie, “Bridge of Spies.”) Monday marks the 26th anniversary of the fall of the Berlin Wall and Ticos and visitors alike can see a piece of it here in San José. But how did it end up here? Basically, Costa Rica asked for it, said Foreign Minister Manuel González. 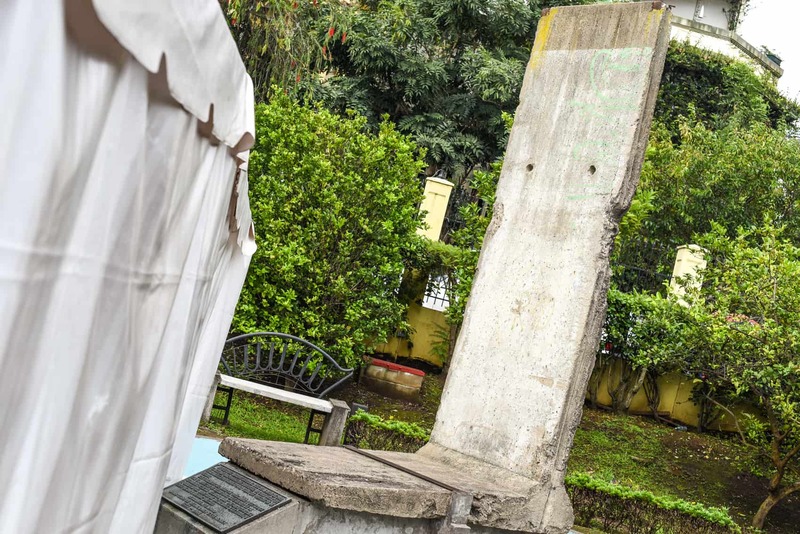 González told The Tico Times that then-Costa Rican Foreign Minister Bernd Niehaus Quesada, who also served as Costa Rica’s ambassador to Germany, requested a piece of the wall after seeing sections of it presented to other Latin American countries, including Mexico and Argentina. This section of the Berlin Wall was officially gifted to Costa Rica on April 12, 1994 to commemorate the 150th anniversary of the Foreign Ministry. “I don’t think he thought they would send such a big piece,” González laughed. The minister said that the wall is made of concrete so there’s little concern about the elements damaging it. The rain and wind could damage its graffiti, and those sections have been painted with a special coating to protect them. The concrete may stand up to the test of time, but some in Germany are concerned that in the eagerness to move past that dark period the remaining sections of the Wall will be destroyed or carved up and maybe even forgotten. The German magazine Der Spiegel published an article in 2009 noting that the wall in its original form has been largely lost.The wall has not been submitted for consideration as a UNESCO World Heritage Site, and only a quarter of it is under some kind of historical protection. There are 300 large sections of the border wall around the world — more than remain standing in Germany, according to researchers who spoke with Der Spiegel. González said Costa Rica’s Foreign Ministry is looking for resources to staff a guard at the monument so that the public can see it up close. But for now it’s only visible from the sidewalk on the north and east sides of the ministry.